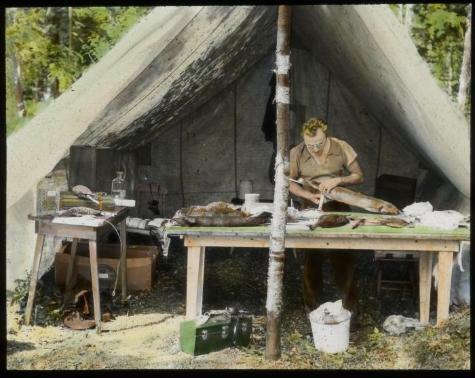 College of Forestry faculty member preparing specimens caught at the Huntington Forest preserve in the Adirondack Mountains. Working at an outdoor lab, snowshoe hare, black duck, a common merganser and a ring-billed gull are being prepared. Source: College of Environmental Science and Forestry, Terrence J. Hoverter Archives, Dept. of Extension photographs, negatives and slides, Metal stand.